Biostar might be fashionably late to the mechanical keyboard party, but its recently announced GK3 plank might end up turning a few heads for no other reason than its price tag. The MSRP is set at just $45. The price point isn't all that shocking coming from Biostar, a company with a reputation for producing budget motherboards. More recently Biostar has tried to gain favor with gamers and enthusiasts through its Racing branding, and the GK3 is part of that (only without the checkered prints that accompany its racing motherboards). While the price isn't all that surprising, users might be shocked to discover this isn't some rinky-dink keyboard made of cardboard and stickers, at least not from what we can tell from the press photos and product page (we haven't played with one in person yet). Instead, Biostar claims it's a durable plank constructed from an "aluminum metallic material" that forms the frame. Adding to the look are noticeable screws in the top two corners, something we've seen on Das Keyboard's Division Zero X40 featuring a removable faceplate (Biostar doesn't mention anything about the faceplate coming off). The keyboard is also waterproof with drain holes to protect against spills and a sloped design to channel liquid away, and dustproof with keys that have a large surface area to minimize the amount of dust that can settle inside. Biostar opted for Outemu Blue mechanical key switches with Alps-compatible stems, which from what we can gather are Cherry MX Blue clones. They're rated for 50 million keystrokes and have a peak actuation force of 60G (± 10g). The press photos make it look like the GK3 features RGB backlighting, though that's probably deceiving. A closer look shows they're likely different lighting zones with multiple colors available. All Biostar has to say on the matter is that it sports seven backlight modes: starlight, wave, breathing, ripple, static, single, and adjustable. In any event, we'll be keeping our eye out for this one. 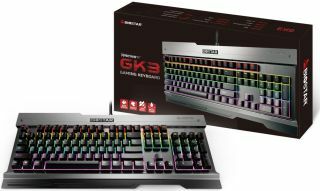 If the key switches really are comparable to Cherry MX Blues, the GK3 could end up an interesting lower-cost entry into a crowded field of contenders. And if not, well, there are plenty of other options out there. There's no word yet on when the GK3 will be available to purchase.